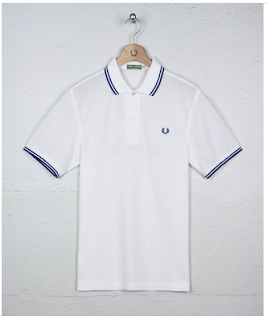 LUXE Models Blog: Murray to Follow in Fred Perry's Footsteps? Murray to Follow in Fred Perry's Footsteps? Yesterday Andy Murray made the hottest day of the year so far even hotter when he won the Wimbledon 2013 men’s final. Murray became the first British man in 77 years to take home the trophy, the last being the iconic Fred Perry, who was known as the greatest tennis player of his era. However, many people, especially the younger generation, now know Fred Perry not just as a tennis player but as a fashion designer. Perry’s label began in the late 1940s when an Austrian footballer, Tibby Wegner, approached him with an anti-perspirant device that he had invented to be worn around the wrist. Perry liked the idea and made a few changes to the design, thus creating the first sweat band. After the success of the sweat band Wegner’s next idea was a sports shirt, which used the original Wimbledon symbol as its logo. The sports shirts proved to be a hit, leading the Fred Perry brand to become popular all over the world, with it previously being the clothing sponsor of our latest champion, Andy Murray. Although Andy does have sponsorship deals with brands such as Adidas, there has been no mention of him creating his own fashion line. Who knows, with his popularity soaring at the moment, here at Luxe Models we wonder if a new clothing line could be on the horizon.